TALL IN THE SADDLE is a standard old-fashioned B-western, given more of a mystery bent from its somewhat complicated script. Dullish and forgettable despite lots of fisticuffs and some gunplay. Taciturn John Wayne shows up for a job as a ranch foreman but backs off when he realizes that he’ll have to work for a skirt. 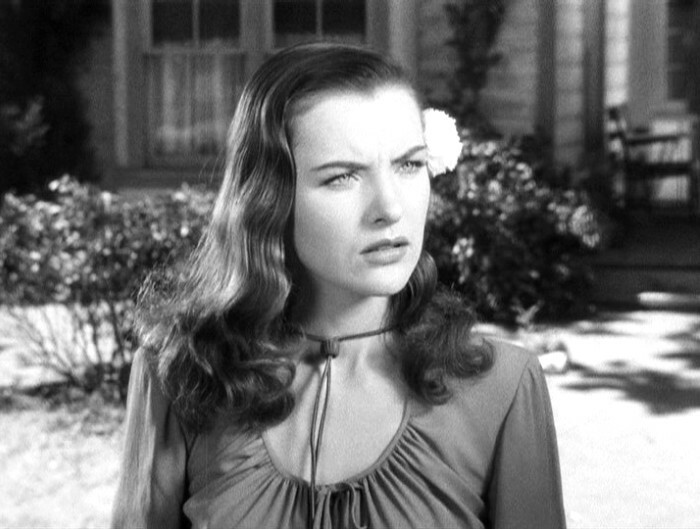 “You might as well know right now that no woman’s gonna get me hogtied and branded.” Despite this unchivalrous attitude, firebrand Ella Raines vamps our hero, while the tiresome Gabby Hayes gibbers nonstop and Ward Bond as a crooked judge plots coolly to get his cut off the deed to the proverbial homestead. It did sturdy business of $2,000,000, roping a tidy profit of an investment of $565,000. Duke and pal Ward look good slugging it out together and Ms. Raines makes a fairly vixenish little hellcat. Another Wayne buddy, Paul Fix, wrote the script, and aside from playing one of the plot’s half-dozen bad guys he also managed to break up his marriage by getting involved with the sultry Raines, making for some 1944 Home Front fireworks. Wayne fans and western list-tickers will chalk it up and mosey along: little of interest for those not inclined. 87 minutes directed by Edward L. Marin, with Elisabeth Risdon, Audrey Long, Russell Wade, Don Douglas, Frank Puglia, Emory Parnell, Raymond Hatton, Russell Simpson and Harry Woods.